The new Cutera® Titan™ gives you an all natural option to actively turn back the clock on aging skin. Using light energy to stimulate new collagen growth deep beneath your skin’s surface, Titan can tighten skin on your face, arms, abdomen, and legs. It’s an ideal solution to enhance your youthful and healthy appearance without need of surgery, recovery time, or injections. Titan utilizes a safe, infrared light to heat the dermis well below the skin’s surface. This heating can cause immediate collagen contraction resulting in tighter skin. During the procedure, the skin’s surface (epidermis) is protected through continuous cooling with the Titan handpiece. After the laser skin tightening procedure, new collagen growth results in further tightening with the improvement of lax skin, folds and lines. Titan employs light energy because it provides a more uniform distribution of energy for heating the deep dermis than other energy sources, such as RF (radiofrequency). Patients have been successfully treated in many areas of the body where a skin is lax. Loose skin along the jaw line, under the chin, the abdomen and upper arm have responded particularly well to the procedure. Since the Titan procedure is heating tissue under the skin’s surface, patients of any skin type can be treated. Men and women of all ages and skin types are potential candidates. 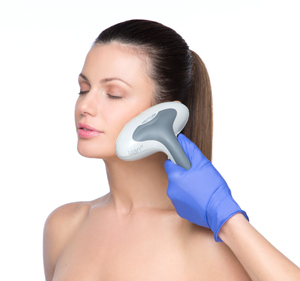 Many may use Titan as a laser treatment for loose neck skin to non surgical jowl tightening treatments. Your physician can advise you if the Titan is right for you. A single skin tightening treatment has produced very good results for some patients. Your physician will advise you as to the number and frequency of treatments recommended for optimal results. Here are some examples of laser skin firming results performed by our professionals. One of the latest skin tightening treatments of the 21st century, unfortunately not yet done by us in the UK, however we do provide skin tightening surgery abroad.